Preheat oven to 180C. In a small bowl, combine the dates with a little hot water and let them soak before blending them in a food processor into a paste. In another bowl, mix the butter, honey and sugar until smooth and add one egg at a time mixing well. Fold in the date paste until smooth, then alternate adding the flour (mixed with salt, baking powder and soda) and milk until well combined but not over mixed. Pour into a cake tin and bake for 20 – 25 minutes. In a saucepan, heat the cooking cream, butter, sugar and salt. Simmer on low heat until it thickens, for a few minutes or so. 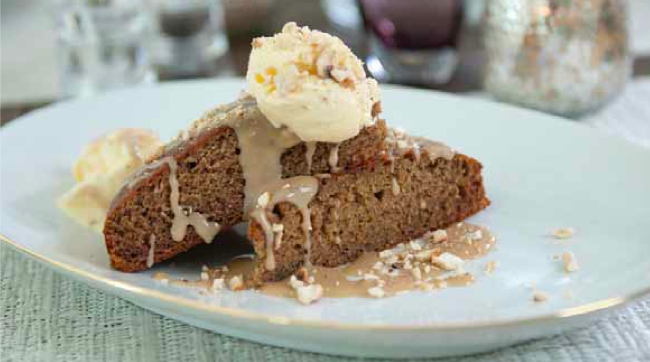 Place a 2 slices of date cake on a plate, drizzle with sauce, add the ice cream and sprinkle with nuts. Delicious!